As you ponder the issues around infrastructure management, consider the advantages of leveraging the knowledge and experience of the people who have specialized in Baan implementations for 15 years. Since Baan is undoubtedly the biggest user and generator of data in your business, we at Business & Decision have focused ourselves on becoming experts at helping clients augment, optimize and economize their IT infrastructures through Managed Services. 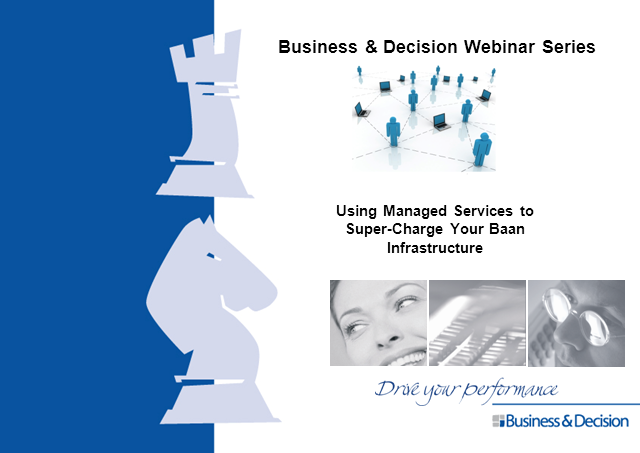 In this live webinar by senior B&D Baan and Managed Services consultants, we will explore the many ways Managed Services can help you contain costs, manage demand and cost-effectively outsource some of the most demanding and sometimes frustrating aspects of managing an IT infrastructure. This includes hosting, version control, disaster recovery, and 24/7 support from B&Ds onshore/offshore Global Delivery Center. Join us for an informative 30 minute presentation on January 30, 2012 at 1pm when you can learn about B&D Managed Services and the value they deliver to your organization.